What’s in a Safety Meeting? 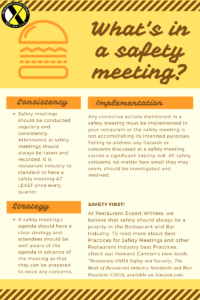 This Infographic is brought to you by the team at Restaurant Expert Witness. To learn more about Restaurant OSHA Safety and Security, The Book of Restaurant Industry Standards and Best Practices ©2016, or to purchase a copy, Click Here.